Amplifying – or plugging in – an ‘ukulele is a blessing and a nightmare. It allows you to make your ‘ukulele many times louder than it sounds acoustically, but to get a halfway decent sound through an amp or PA, a lot of things have to go right. Any ‘ukulele will do, but it needs to have a pickup installed in it. A pickup converts vibrations into an electronic signal. This allows you to strum the strings and pass that sound through a cable. Magic! This can be any 1/4″ phono jack guitar cable. As long as it reaches from your ‘ukulele pickup plug to the amp, you’re good to go. That said, 90% of gear problems are related to bad cables. You get what you pay for. 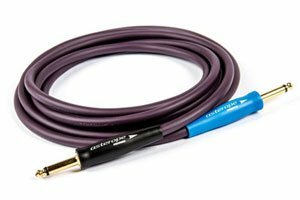 I thought $40 for a 10’ cable was outrageous when I bought my first Mogami Gold, but I’ve never, ever had a problem with it. I can’t say the same of my many cheaper cables. Not that you need to drop lots of cash on a cable right away, but buying the cheapest cable you can find might not be wise. This is the muscle that actually makes your ‘ukulele louder – a speaker in a box. Amplifier: An amp in this sense is an all-in-one package that includes the circuitry and speaker(s) in a single box. Many times an amp will have features tailored to its intended instrument (electric guitar, keyboard, acoustic instruments). An amp is probably your best bet if you are new to plugging in your ‘ukulele. A MicroCube sized amp will give you tons of options in a small, cheap package. Public Address System (PA): If you want more volume, configuration options, and the opportunity to amplify additional instruments or microphones, a PA is what you’re looking for. A PA has more components than an amp: a mixer that controls the volume of each channel and sums them together, an amplifier circuit (if using passive speakers), and speakers. The trade-off for the PA feature set is connivence. First, plug your amp or PA into an outlet (A PA requires additional connections, but I won’t go into that here – read the manual!). Before powering up, make sure that all volume knobs or sliders are at zero. Plug one end of the instrument cable into the jack on the bottom of your ‘ukulele until it “clicks” into place as far in as it will go. Plug the other end of the cable into the “input” jack on your amp or mixer in the same fashion. If your ‘ukulele pickup has a volume control, set it to 3/4 of the way up to start. Turn the volume knob up on the amp or mixer as you strum the strings until you reach the desired volume level. Gain: Controls the input volume and how much signal goes into the amp circuit. Too much gain will give you distortion (sometimes desirable), too little and you aren’t taking full advantage of the amp’s power. Usually you want it “hot” enough that the signal just starts to clip – or distort – when you play loudly. EQ (Equalization): Controls the amount a frequency band is amplified. EQ is often configured as a single knob that fades between exaggerating bass or treble, or as a three knob setup that give separate volume to low, middle, and high frequency ranges. Let’s be honest, 90% of people who want to try plugging in their ‘ukulele do so because they want to play around with the fun sounds they’ve heard about. These fun sounds are created by effects pedals – circuits housed in a box that add to or change the signal. Feedback is the nasty screeching sound that you hear when a mic gets too close to a speaker. This can also happen with acoustic instruments and in a lower register. You get feedback when the speaker vibrates the pickup source and feeds the signal back through the system. This creates a loop that gets louder and louder. High Frequency Feedback – Just like it sounds, high frequency feedback is a nasty, dog-melting shriek that makes you want to pack up and go home. Most times HFF is created by a microphone being too close to a speaker, but it can also be created by ringing strings on an instrument. Low Frequency Feedback – This happens when a bigger surface (like the instrument’s soundboard) catches the vibrations of a speaker and starts a feedback loop that exists in a low register – more of a hum than a shreik. Eliminating feedback starts with your setup. Nine times out of ten, if you put your ‘ukulele or mic directly in front of a loudspeaker or amp producing any decent volume level, it will feed back. Instead, line yourself up so that the speaker is angled at least 45 degrees away from your instrument or the mic. This can be achieved by moving your amp or speakers to the side or by shifting your position. Being behind your mains as much as possible helps a ton. Many times this is all it takes to run feedback-free all night long. Experiment. If you’re still having trouble, take a look at the room you’re playing in. Surfaces reflect sound. The harder the surface, the more sound it will reflect. If you set up in a small concrete basement, there are probably very few places you can put your mic to avoid feedback. I’ve heard of monitors (speakers on the floor pointing up at you so you can hear yourself) being so loud that the sound bounces off your face and into the mic, creating feedback. Turn down the volume. If you crank any system loud enough, it WILL feed back. Change the EQ. Amplifying an ‘ukulele is rarely even in the EQ department. By twiddling the knobs you can often find a more natural sound that doesn’t emphasize frequencies that tend to feed back. A notch filter is a sharp EQ cut at a very specific frequency. This feature can usually be found on a good preamps or amp. It basically removes the entire problem frequency, but is such a thin slice out of the pie that your ear doesn’t notice. Reduce the resonance of the instrument. Some people stuff socks inside the ukulele’s body to dampen possible body vibrations at loud volumes. Others say to duck tape the sound hole closed.